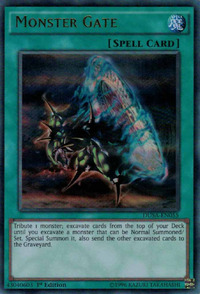 Tribute 1 monster; excavate cards from the top of your Deck until you excavate a monster that can be Normal Summoned/Set. Special Summon it, also send the other excavated cards to the Graveyard. Giga Gagagigo and Dark Magical Circle appear in this card's artwork. Dimension Fortress Weapon: “Reasoning” and “Monster Gate” cannot be activated while “Dimension Fortress Weapon” is on the field. If their effects were activated and “Dimension Fortress Weapon” was Summoned in a chain, their effects are not applied. Tributing 1 monster in your Monster Zone is a cost to activate this card. Special Summoning and sending the excavated cards to the Graveyard are considered to happen simultaneously. If you have no monsters that can be Normal Summoned/Set in your Deck, this card cannot be activated. While the effect of "Stellarknight Constellar Diamond" or "Dimension Fortress Weapon" is being applied, "Reasoning" and "Monster Gate" cannot be activated. When resolving "Reasoning" or "Monster Gate", if the effect of "Stellarknight Constellar Diamond" or "Dimension Fortress Weapon" is being applied, the effect of "Reasoning" or "Monster Gate" is not applied. : While the effect of "Stellarknight Constellar Diamond" or "Dimension Fortress Weapon" is being applied, can "Reasoning" or "Monster Gate" be activated? While the effect of "Vanity's Fiend" or "Fossil Dyna Pachycephalo" is being applied, "Reasoning" and "Monster Gate" cannot be activated. : While the effect of "Vanity's Fiend" is being applied, can "Reasoning" be activated? When resolving "Monster Gate", if the effect of "Vanity's Emptiness" is being applied, since you cannot Special Summon any monster, no card is excavated from the Deck. (Cards are not sent to the Graveyard and no monster is Special Summoned.) When resolving "Reasoning", if the effect of "Vanity's Emptiness" is being applied, since you cannot Special Summon any monster, no card is excavated from the Deck. (Cards are not sent to the Graveyard and no monster is Special Summoned. ): If "Vanity's Emptiness" is activated in a chain to "Reasoning" or "Monster Gate", what happens? While the effect of "Evilswarm Ophion" is being applied, if you have a monster that can be Normal Summoned/Set in your Deck, "Reasoning" and "Monster Gate" can be activated. When resolving "Monster Gate", if a Level 4 or lower monster is excavated, it is Special Summoned normally, but if a Level 5 or higher monster is excavated, it is sent to the Graveyard with the other excavated cards. When resolving "Reasoning", "If that monster is the same Level as the one declared by your opponent, send all excavated cards to the Graveyard." is applied normally, but when resolving "If not, Special Summon the excavated monster, also send the remaining cards to the Graveyard. ", if a Level 4 or lower monster is excavated, it is Special Summoned normally, but if a Level 5 or higher monster is excavated, it is sent to the Graveyard with the other excavated cards. : While the effect of "Evilswarm Ophion" is being applied, can "Monster Gate" or "Reasoning" be activated? "Wulf, Lightsworn Beast" is a Special Summon Monster. It cannot be Normal Summoned/Set. Therefore, even if "Wulf, Lightsworn Beast" is excavated by "Reasoning" or "Monster Gate", it is not Special Summoned and you will continue excavating cards. After that, it will be sent to the Graveyard with the other excavated cards. : If "Wulf, Lightsworn Beast" is excavated by "Reasoning" or "Monster Gate", can it be Special Summoned? If "Metaion, the Timelord" is excavated by "Monster Gate", it is not Special Summoned. After "Metaion, the Timelord" is excavated, "Monster Gate" stops resolving, and all excavated cards are sent to the Graveyard, including "Metaion, the Timelord". : If "Metaion, the Timelord" is excavated by "Monster Gate", can it be Special Summoned? If you pick up a Spirit Monster, you cannot Special Summon it and it is sent to the Graveyard. If you pick up a Guardian and don't have the corresponding Equip Spell Card on the field, you cannot Special Summon the Guardian and it is sent to the Graveyard. If you have the corresponding Equip Spell Card, the Guardian is Special Summoned. If you go through your whole Deck without finding a card to pick up, "Monster Gateispicked up are shuffled back into the Deck. Your opponent can chain "Royal Oppression's" effect to negate "Monster Gate's" effect. Cards picked up that cannot be Normal Summoned are considered "sent to the Graveyard", not "discarded". If you Special Summon "Dark Magician of Chaos" with "Monster Gate", the effect of "Dark Magician of Chaos" activates, but it activates after "Monster Gate" has fully resolved and sent other picked up cards to the Graveyard, so you can use "Dark Magician of Chaos" effect to retrieve a Spell Card that was picked up and sent to the Graveyard by "Monster Gate" in the process of searching for the "Dark Magician of Chaos".The latest print of "Dark Magician of Chaos" uses Problem-Solving Card Text, which makes it clear that its effect activates during the End Phase of the turn it was Normal or Special Summoned, not when it is Summoned. This difference is due to a major change in the functionality of "Dark Magician of Chaos". Infernal Incinerator:" This card can be Special Summoned (even from your Deck, with a card like "Monster Gate"). You do not have to discard your hand when you Special Summon this card. Royal Oppression:" You can activate the effect of "Royal Oppression" as a chain to "Monster Gate". No cards will be picked up, and no monster will be Special Summoned (The opponent still must have Tributed a monster as a cost). Serial Spell:" If you chain "Serial Spell" to "Monster Gate" resolve the effect of "Monster Gate" twice (once for "Serial Spell" and once for "Monster Gate") even though you only pay the cost once (for "Monster Gate"). Soul Exchange:" You can Tribute the targeted monster for any card that requires a Tribute, or for a Tribute Summon. So you could Tribute it forthe cost of "Monster Gate".